Objectives: We sought to examine, in a rural county in the West of Ireland, the degree of familial relationship between schizophrenia and other nonaffective psychoses and affective illness (AI). Design: A case-controlled epidemiologic family study using DSM-III-R criteria. 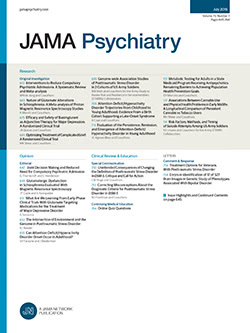 Participants: This study incuded three proband groups: (1) all cases with a clinical diagnosis of schizophrenia from the Roscommon County Case Register born from 1930 onward (n=285); (2) a random sample of cases from the register with a clinical diagnosis of severe AI (n=99); and (3) a matched, random sample of Roscommon residents ascertained from the electoral register (n=150). Face-toface structured interviews were conducted with 86% of traceable, living relatives (n=1, 753) and 88% of traceable, living probands (n=415). Results: In interviewed relatives, the lifetime risks (±SE) for schizophrenia, as a function of the "blind" proband di- agnosis, were as follows: schizophrenia, 6.5% ± 1.6%; schizoaffective disorder, 6.8%±2.5%; schizotypal personality disorder, 6.9%±3.9%; other nonaffective psychoses, 5.1%±2.4%; psychotic AI, 2.8%±1.2%; nonpsychotic AI, 0.6%±0.6%; and control, 0.5%±0.3%. Individuals with schizophrenia reproduced at a rate about one quarter that of controls and the risk for schizophrenia in parents of probands was much less than that found in siblings. Conclusions: These results support the following hypotheses: (1) in the West of Ireland, as in other populations, schizophrenia is a strongly familial disorder; (2) schizophrenia shares a familial predisposition with a spectrum of clinical syndromes that includes schizoaffective disorder, other nonaffective psychoses, schizotypal personality disorder, and probably psychotic AI, but not nonpsychotic AI; and (3) the diminished reproductive rates associated with schizophrenia have a large impact on the pattern of risk of illness in relatives.